Hope you pay him well! LOL Happy Holidays!!! Hahaahaha.. love it! My wiener will have none of that. We tried putting a sweater on him, and he got so mad. What a look! 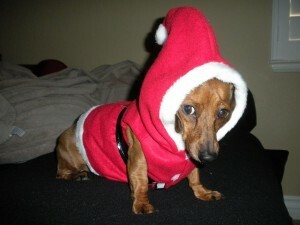 I hope there’s a big box of Milkbones under the tree for Schatze! Oh, now, this is way too cute!